Dublin is due a decent detective, and in Séamus Joyce, Cormac Millar has created someone up to the job. [...] The novel becomes absorbed in the details of Dublin's legal and media scenes, populated by such characters as "that slithy tove, Peter Simons of Radio Free Dublin". Are these worlds as murky as the drugs business? To call your hero Séamus Joyce is to invite serious critical attention, but it is as a readable crime novel that An Irish Solution succeeds. The first instalment fills a vacancy in the detective market and offers scope for future Joycean adventures. Cormac Millar's debut novel powers along at a fine old pace and comes with a dose of irreverence thrown in. The characters are vividly drawn and the seedy world of drug dealers and users is also potently portrayed. As crime novels go, this is up there with the best and marks out Cormac Millar's fresh voice as something to be reckoned with— Kirkus Reviews UK , quoted on the Amazon web sites. An Irish Solution points a way forward for Irish crime fiction, and demonstrates how Irish-style corruption can provide fuel for the form. [...] Could do for Ireland what Dibdin has done for Italy. Millar [...] could be the one to bring Machiavelli into Irish crime writing. His hero Joyce, bureaucrat turned crusader, might yet clean the Augean stables of Irish politics. 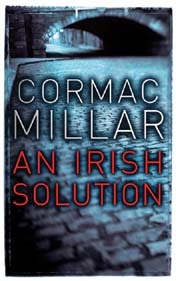 Cormac Millar's story of an ambitious cabinet minister's campaign against the drug trade, An Irish Solution (Penguin, £9.99 pbk), must make him persona non grata in Irish politics and police circles, as he takes apart both establishments with a waspish wit. Corruption at a high level, planting of evidence, bribery and intimidation - the unfortunate acting head of the newly created Irish Drug Enforcement Agency finds himself in the midst of a conspiracy, with only a schoolgirl and a nun prepared to stand up against it. This superbly confident first novel introduces an author with a distinctive style and scalpel-sharp characterisation.